Open up your home to the outdoors and enjoy the beautiful scenery around you with Custom Built's Patio Doors. Let in the light you want, without sacrificing the quality, security, and insulation you need. Here at Custom Built we offer just the kind of doors that you need for this. Our vinyl patio doors provide convenient access to your yard while also allowing unobstructed views thanks to insulated glass that will stand up to the outdoors. Our easy operating sliders ensure years of trouble-free operation so you'll be able to continue using your doors season after season. Our interlocking systems and weather-striping also provide you with one of the most weather tight seals available. You can also choose from our Vinyl or Aluminum frames available in a variety of colors and with multiple screen options. Fit your home's distinct style while improving the quality of your room. Call us at 1-844-906-0993 to speak with one of our knowledgeable specialists or click below to fill out our simple online form for a free estimate in Albany, Troy, Colonie, or nearby. 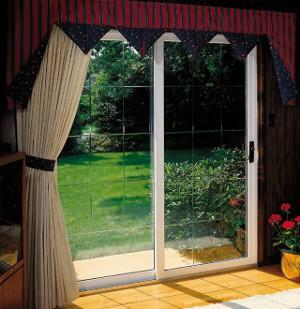 Why replace your patio door? We install beautiful vinyl patio doors in New York. A variety of door styles, materials and glass options let you customize your door for enhanced visual appeal, energy efficiency, durability and security. Our replacement patio doors are custom fit for your home to provide you with worry-free performance. f you've always enjoyed bringing the scenery indoors but don't want to bring the weather in with it, check out Custom Builts Imperial rigid vinyl Patio Door. Re-think the whole concept of patio doors with one of the strongest, best engineered, and best insulated sliding glass doors on the market. Available in a variety of styles and colors, get the perfect custom look for your space without sacrificing the energy efficiency of your home. Jamb section reinforced with steel for durability and maximum frame strength that will let it last. Door panels are reinforced with specially designed aluminum extrusions – which makes for unparalleled strength, durability and trouble-free performance. Triple-seal design and airtight weatherstripping between outdoors and inside assures one of the most weather-tight seals you can find anywhere. Keep dust, air, water, and debris out of your home while letting light in. A latching device pulls the frame and panel closer together, making a more secure, weathertight product. A raised aluminum track prevents the door panel from racking and twisting off its track, as well as keep it free of obstructions. Two sets of double-wheeled, stainless steel, pivoting roller wheels provide years of smooth, trouble-free operation. 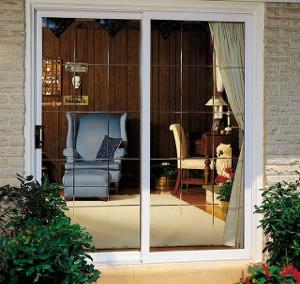 7/8″ Tempered Insulated Glass for maximum energy efficiency. Extruded Aluminum rolling screen with two spring loaded, ball-bearing rollers for easy operation. Anti-take out blocks keep the fixed panel in place so your door stays on track and operates easily and efficiently. Colonial, Prairie or Diamond Grids available between the panes of glass instead of on top for easy cleaning. Etched Shadow Bevel Glass in a Colonial pattern is also available for doors with 3′ panels. White or beige vinyl – in and out. Bronze or Cocoa exterior with a White interior. Standard sizes are 5′, 6′, 8′, 9′, and 12′ widths, – all 6’8″ high. Start your patio door installation right with a free quote! Interested in installing a new patio door? Contact us today to schedule an in-home consultation to discuss your door replacement project with one of our experts. We provide free estimates for window and door replacement and installation in Latham, Guilderland, Delmar, Cohoes, Watervliet, Slingerlands, Coeymans, and surrounding areas.